Di Nigerian National Petroleum Corporation (NNPC) say dem don step-up dia arrest of oil marketers and fuel sellers wey dey cause artificial scarcity for di country. Ndu Ughamadu, di Group General Manager of NNPC write inside statement say dis arrest go help reduce fuel queues for Nigeria because dis marketers dey like kolobi fuel wey dem suppose dey sell. NNPC don already get Special Task Force wey dey monitor filling stations. Ughamadu say NNPC don already arrest some people including two filling station managers wey kolobi 66,000 litres of petrol and six people wey dey sell fuel for streets for Abuja. Di Task Force bin arrest two managers of filling stations for Abuja wey hide trucks of petrol wey di filling station get. Dem carry di managers give di Nigeria Security and Civil Defence Corps for punishment. 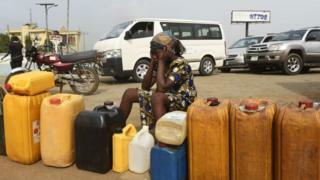 Di filling stations go also pay N250, 000 fine for every litre of petrol wey dem kolobi.